Many modern language teachers have heard of mobile learning and yet they are hesitant to try it. Here are some common myths. 1) I need tons of mobile learning professional development. Traditionally, professional development focused on learning the technology. If you have a smartphone or tablet and can do the basic functions, you have enough of your own professional development to start using mobile learning in your class. If you do not have a mobile device, take 2-3 minutes of class to ask your students what app they would use to do a certain task such as audio recording or creating a video. Students are the expert in the use of the mobile devices; we just have to harness those uses for modern languages. 2) I do not have a curriculum for mobile learning. Mobile learning is only a tool to help you in the modern language classroom so the only curriculum you need is your modern language one. Once you know what language learning task you want, you can have the students help you find an appropriate app for it. 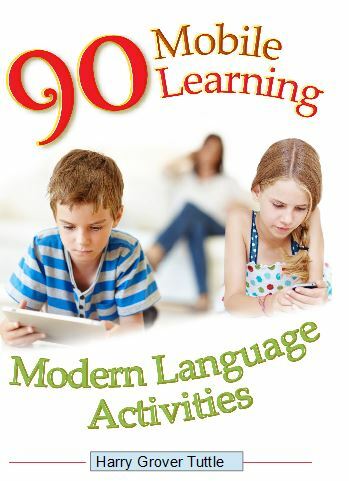 3) Every student does not have a mobile device so I cannot do mobile learning in my modern language class. Have students work in pairs or in groups of three so that at least one person has a mobile device. 4) I do not have the money to purchase apps for my students. Many common apps such as video recording apps are free. Only use the free version of the apps. You can do a year’s worth of activities without having to purchase any paid apps. 5) I do not have a 1,000 apps like another modern teacher has. Mobile learning is not about collecting a multitude of apps; it is about helping your students to improving in their language skills. You can do a whole year’s worth of mobile learning with a few common tools natively found on the mobile device such as picture taking, audio recording, and video recording. Instead of having your student learn many different apps, find a few apps like video recording app that can be used for many different things such as interviews, telling a story, making a movie about an event, etc. 6) I do not have the time to find drill and practice apps. Save your time and focus on developing your students’ speaking communication through the common mobile tool apps. They can take a picture of a friend or family member and describe that person to their partner. 7) I already have too much to do so I cannot do mobile learning. Mobile learning replaces many classroom activities. Instead of students looking at one textbook picture of a city in your target language, they can do a quick google image search on their mobile device for the city and see many diverse images of the city. The students probably can find a google image quicker on a mobile device than they can open the textbook to the right page. Mobile learning with QR (quick response) codes can take students instantly to a video, sound file, web page, or picture. 8) I have no way to collect what they do on their mobile device If the students have taken a picture, done an audio recording, done a video recording, etc, they can email it to you. Students do the task, click on a share icon and email it to you as an attachment. Students can show you their picture or even project it for the whole class using a document camera. 9) I do not know where to start so I won’t start. Start simple with students talking about family or friend pictures on their mobile devices. You can do many diverse speaking activities based on pictures on their devices or pictures you ask them to take such as of their living room. When will you start to use mobile learning for more language communication in your class? Modern Language Communication vs Grammar Focus: What is Your Focus? Imagine walking up to a target language speaker and saying “I talk, you talk, he/she/it talks, we talk, they talk”. The native speaker would look at you weirdly since you are not communicating. You are reciting grammar. Furthermore, imagine a native speaker listening to a person who says , “Yesterday I to buy in store”. The native speaker would hesitate a little but still understand the person. However, if the person said, “Yesterday I swam in the store”, the native speaker would have no idea of what the person was trying to say even though the sentence is grammatically correct. How do you know if you are focusing on grammar instead of on the communication of ideas? 1) A grammar based class focuses on correctness, not on communicating ideas. “Did you buy candy yesterday? Yes, I bought candy yesterday.” has a grammar focus if the teacher concentrates on the correct form of the past tense of the verb. If the teacher does not want to know more about the candy, then it is probably a grammar exercise. 2) In a grammar based or vocabulary based class, students do not comment or respond to the meaning of statements made by other students. Communication is an interactive exchange of ideas. John says, “I like to swim I do not like to walk.” and his partner, Jane, waits her turn to say her two sentences using this specific verb structure. Jane is not responding to John. She simply waits to talk regardless of what he said. In true communication, John’s partner, Jane would respond to “I like to swim” with something like “Me, too” or “Where do you swim?” She listens and responds directly to her partner’s statements. She inquires. She interacts with John. She does not just exchange grammar based sentences that have no personal meaning to either speaker. 3) In a grammar based class, more of the textbook pages deal with grammar than anything else. Most of the class exercises center on grammar. Most of the workbook or electronic exercises concentrate on grammar. The teacher spends most of the class time in practicing the grammar. A teacher can time him/herself during a class to see where he/she spends most of his/her time by writing down each classroom activity and how long each takes. At the end of class, the teacher totals the different categories of classroom activities and divides by the total minutes of class. 4) In a grammar based class, the teacher’s main corrections are grammar based, not on how to communicate better. A grammar based teacher spends very little time on teaching common responses such as “Me too…Me, neither, I do not agree” and does not correct students when they do not use these expressions. The communicative teacher does spend much time on specifically teaching language functions such as words or phrases for elaboration, inquiry, persuasion and constantly helps students to use these expressions. The teacher’s corrections center on meaning. 5) In a grammar based class, most student responses are short one sentence responses that show the correct verb form.. Or the students say a series of unrelated sentences that use the particular verb form. In a communicative class, students often elaborate on their responses using multiple sentences. “Yes, I bought candy. I really like chocolate because it is so sweet. I usually buy five candy bars and I share one with my father.” Each sentence adds more information to the original personal idea. 6) In a grammar based class, students mainly respond to a specific question or statement. Their speaking is very structured and very controlled. In a communicative classroom, students spontaneously speak and they can go from topic to topic. Students may start to talk about school, then they talk about the school’s sport team, next they move on to a sports game on TV. Their conversations resemble a natural conversation with all of its twists. Is your classroom grammar or communication based? If you would like to see some communicative activities, I have some available at TeachersPayTeachers http://bit.ly/tpthtuttle (see below). I recently did a presentation on improving students’ oral communication through formative assessment and someone asked how much time I spend on having my students speak. in the target language. My definition of student speaking in the modern language does not include doing grammar exercises such as “Did you buy the fruit? Yes, I bought it” where the focus is on the correct verb form. Neither do I include in the category of speaking vocabulary exercises such as “What do you do with your pen? I write.” These sentences do not communicate ideas;they only practice grammar or vocabulary. My answer to how much the students should be speaking in the modern language class is to take the percent for the speaking part on the final and multiple it by the number of minutes in a class. For example, if speaking on your final counts 20%, then multiple 20% percent x 40 minutes of class = at least 8 minutes of speaking per student per class. When students work in pairs during a conversation, then students can accumulate minutes easily. If we believe that oral communication is critical and if we want our students to be speakers of the language, then we have to allocate at least eight minutes of each class to develop their speaking in the target language. We need to have speaking activities that allow for the exchange of reactions and ideas. When students really communicate with one another, they become very engaged. For how many minutes do your students speak each class?